If you're as huge a fan of Eddie Vedder's film, Water on the Road, as I am than you'd love nothing more than to see him release his solo shows as official bootlegs the way Pearl Jam does. Obviously this is completely Eddie's call and we all have complete respect for that. 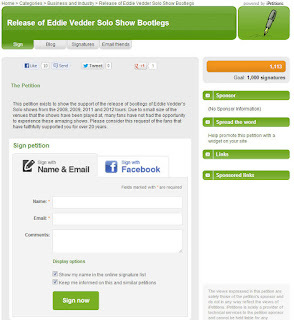 This petition is to show him that his fans fully SUPPORT him and would love the opportunity to hear more of his solo work. I'd like to thank Jason for putting this together and pouring a great deal of effort into spreading the word. Click here to digitally sign the petition. It only needs a name and email.